Montgomery Clift and Deborah Kerr both appear on my list of admired thespians. It’s difficult to ignore the contributions both made to cinema during their time. Yet, I don’t think either of them is ever remembered as they ought to be. It’s more than them never being remembered by Oscar (Wood, Dietrich, Grant, Burton fall in the same boat), but whenever we think of the classics, I rarely recall them getting any mention. The two did star in a film together, although I’m probably stretching the truth to say that. 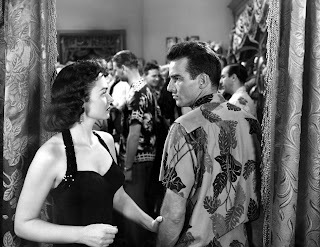 From Here to Eternity is not a story where these two actors unite, but I still remember them first when I think of it. They should have each walked away with their Oscars here, but I’m getting ahead of myself. 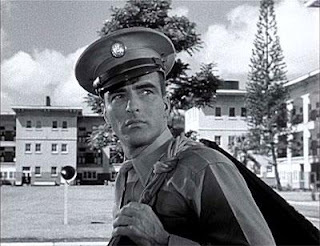 As a war film, From Here to Eternity is less concerned with the implications of the war at hand and more interested in the actions of the people. Remove the setting of Island and the time of the war and the tragedy in the film still persists because of the frivolity of man. It’s not difficult to see the similarities of all the wandering characters. Clift’s Prewitt says so sagely “Nobody ever lies about being lonely” and as Kerr’s ignored wife, Sinatra’s dissatisfied Private, Reed’s “good” call girl and Lancaster’s unhappy Sergeant wander on and off-screen their loneliness is palpable. They meander back and forth searching – reaching out – for some notable human connection. Philip Ober is ostensibly relegated to the role of stock villain. Anyone preventing the amicable Deborah Kerr from happiness couldn’t be too good. Lancaster has never impressed me as a thespian and the relationship forged between he and Kerr always makes me wonder at times. Kerr is not as calculating to play Karen as cold as she could (think, Kristin Scott Thomas’ Sylvia McCordle) but perhaps, that’s the very reason I do like her performance. She’s acts well within in her means, even if her range is not as expansive as I’d like. I’m never sure why Lancaster is regarded so well in this film, though admittedly he plays his role well. He’s never had a wide range, and perhaps Sgt. Milton is tailor made for him. Doubtlessly, though, I’m prejudiced. On the topic of range, Clift’s Prewitt and his tragic outcomes seem to rote for Clift, yet I do regard this performance as one of cinema’s greatest. I know Donna Reed isn’t as wholly loved in her performance as the affable call girl, but I’m rarely moved to doubt her sincerity even as the film plays up to the stereotype of the prostitute with a heart-of-gold. Sinatra, though, is the one who confuses me the most. I may be alone here, but his work as Private Maggio impresses and befuddles me – sometimes simultaneously. He can go from being excellent, to being pedestrian in a matter of second. But after the rumour that the role was written for Eli Wallach (forgotten star of the era) I always think just how lucky Sinatra was to get his hands on the role. From Here to Eternity is remembered most for the shot above and not as much for the performances. I often wonder if my general dissatisfaction with William Holden and Audrey Hepburn has to do with some incidental projection of the Academy's preference of the two over Clift and Kerr. I doubt, that would be too weird. From Here to Eternity, though, represents a fine example of good film making. It's a classic, rightfully so, and features an excellent cast of celebrated thespians - some more than others. Great post Andrew. Interesting take on Frank's Maggio, a performance that impresses me more than anything. I think his drunk scene really helped him to clinch the Oscar. He and Monty have very good chemistry in this. The movie was good, but not a;; that exceptionally great. Zimmerman's direction felt flat, and it brings down almost everything. Clift was excellent and probably should have won the Oscar, and I really do like Donna Reed who everyone else seems to hate. Her performance feels fresh, and rings emotionally true for me. I'm thinking of doing my own 50 Favorite Films over at my blog, and this would DEFINITELY be in the top 10, if not the top 5. Kind words about Clift. I agree he's one of the all time greats. He turned down the leads in "Sunset Blvd" and "East of Eden", if memory serves, and a couple other classics I think, and decisions like that certainly harmed his legacy, though it also speaks to why he could completely capture a character like Prewitt. He had his own agenda which is a quality I respect. tom yeah he and monty do have good chemistry, and that drunk scene is classic. twister i don't really get the hate for donna reed, she makes excellence from just goodness. jude wow. well i can't fault you on the choice, it's a good movie. nicholas probably did harm his legacy, but he's done so much good work and no one remembers. I don't remember liking this too much. It has some good scenes, some (pictured here) which became iconic, but the story... not fully on my taste. I've always liked Donna Reed's performance for two reasons. The obvious one of her excellent work but also for something that isn't necessarily apparent when first watching the film and that is her wholesomeness. The two other actresses considered, Shelley Winters who was actually cast but had to drop out due to pregnancy and Gloria Grahame, didn't have that quality. When Lorene tells Pru her plan to save enough money to go home and be proper you can see Donna Reed being able to do that where the others couldn't. Yes she is obviously a prostitute even if the film insists on calling her a "hostess" but her primness shows how easily she would slid back into her aspired to place in society. Gloria Grahame, a great actress, was anything but wholesome or small town. Shelley was closer but there was a certain lush sensuality when she was young as well as a brashness that worked against the idea of a proper society matron.